Study location: Pondicherry, India Peace and Conflict Studies let you study global matters in an interdisciplinary setting. The course provides education on contemporary issues such as terrorism, war, violent and social conflicts, Human Rights, humanitarian aid, refugee crisis, social inequality, peace and peacebuilding. 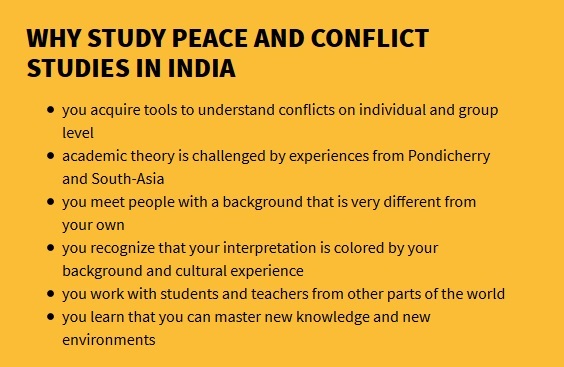 Peace and Conflict Studies is an international semester course offered by the Norwegian organization Kulturstudier and the Oslo and Akershus University College of Applied Sciences, in partnership with Indian institutions and NGOs. What are causes for conflicts on local, regional and international level? Terrorism and Extremism: How do they affect the international community and our societies? How are conflicts resolved or transformed? The majority of the students are from Scandinavia, with an increasing number of participants from other European countries as well as India. The unique experience of Indian culture as well as international student life is very valuable for future studies and career. Kulturstudier offers scholarships to students from India, Bangladesh, Sri Lanka, Afghanistan, Pakistan and Nepal. This is to make our program accessible to local students that might not otherwise have the financial means to participate. With their contributions in and outside of the classroom they help other students to relate stronger to the local environment. The course is taught by renowned lecturers in the field of Peace and Conflict Studies and seminar leaders from all over the world, including India. We are very proud of the international teaching staff who have a vast experience, and who ensure that students receive the maximum benefits from their studies. The close interaction with international lecturers gives unique opportunities to learn about future studies and career opportunities. Students also have the advantage of spending social time with renowned scholars. The main objective of the program is to bring to life the academic theory, and enable the students to make real life comparisons. While it is up to the students to make the most out of the experience, we organize also field studies or visits to NGOs where the students encounter relevant real life examples that challenge the concepts and content of the curriculum. The self-study period: before you travel to India you are expected to get acquinted with the curriculum and write an introductory assignment. 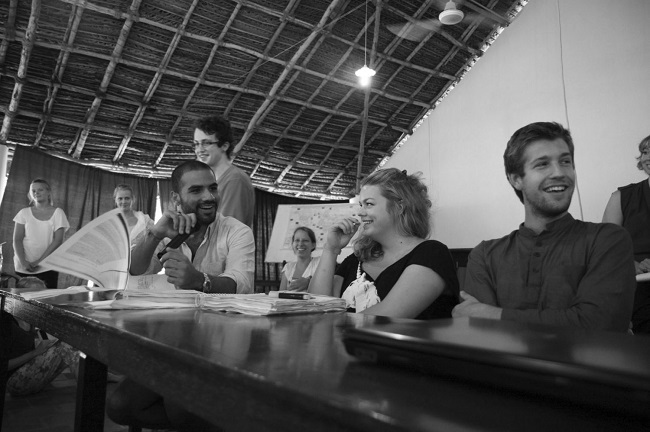 The main periode: consists of ten weeks in Pondicherry with lectures, seminars, field trips and group assignments. Home exam: at the end of the ten weeks you have three weeks to write your home exam. The self study assignment and the home exam can be done anywhere in the world, why not in India? The course is worth 30 ECTS and can be included as part of a bachelor degree. Peace and Conflict studies as a field is founded in multiple disciplines including development, human rights, psychology, international relations and political science. The course gives a solid foundation for future studies in any of these disciplines, for postgraduate degrees in Peace and Conflict or South Asia studies. Should you be interested in a full academic year in India, Peace and Conflict Studies can be combined with Religion and Power. You can also combine the course with any of our other programs in Ghana, Vietnam or Argentina. Many universities in Scandinavia as well as internationally also offer master programs in Peace and Conflict studies. Many students have utilized their background in the course for further postgraduate studies in Peace and Conflict in countries such as UK, Germany, France, Sweden, Norway, and Costa Rica. The British newspaper The Telegraph has put South Asia studies among the top 10 degree subjects by lifetime salary: "As global business begins to take note of the rapid development of the Indian and other south Asian economies, the study of south Asian languages, ... the study of the region's culture and literature – presents a sizeable financial benefit." Moreover, conflict is a part of life, weather your role is president or family member. Research has illustrated the patters of the conflict dynamics, and draws on all the traditional research disciplines, such as economics, sociology, anthropology, geography and political science. This combined with the multicultural context of this study will strengthen your abilities to deal with a world of misunderstandings and conflicting interests. You will benefit from studying tendencies and processes in different societies and periods of change and the training in connecting the individual at micro level to the larger society and global processes. Institute for International Studies at Oslo and Akershus University College (HIOA) holds the academic responsibility for the program. You get your ECTS and state loan/scholarships through and because of HIOA. It is Norway´s largest state owned university college, with approximately 18 000 students and 2000 employees. To apply for the courses you must be eligible for university training. Fill in the application form. If there are still places available we will send you an offer with an invoice for the deposit of 250 Euro. By paying the deposit you confirm your place on the programme. Leading up to the start of the programme we will keep you informed about the preparations for travel and studies.